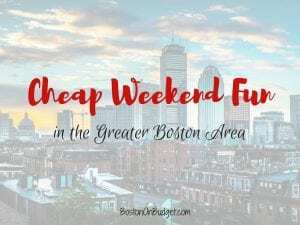 Cheap Weekend Fun in Boston for November 17-18, 2018! America’s Hometown Thanksgiving Parade: Saturday, November 17, 2018 on Main Street in Plymouth, MA. Head to Plymouth, MA for a Thanksgiving parade in the town where it all began! Parade starts at 11am, but there’s activities and fun all weekend long. There’s so many fun things to do in Boston for November 10-11, 2018. Sunday is Veteran’s Day so make sure to thank a veteran and thank you if you are one! Holiday Events at Bass Pro Shops: November 10, 2018 to December 24, 2018 at Bass Pro Shops in Foxboro and nationwide. Get a free photo with Santa with a Bass Pass + enjoy free holiday crafts and activities this holiday season at your local Bass Pro Shops! Fenway Open Studios: November 10-11, 2018 from 11-5pm. Check out the studios of local artists and get the rare opportunity to meet and chat with the artists! MassArt Family Day: Saturday, November 10, 2018 at Design & Media Center at MassArt. Drop in for interactive activities and art making from MassArt students, faculty, and staff. Free and open to everyone, but recommended for ages 6+. Free Entrance Day at National Parks: November 11, 2018. Everyone can get free entrance at National Parks across the nation in honor of Veterans Day! Cheap Weekend Fun in Boston for November 3-4, 2018! I can’t believe it’s the first weekend of November already! Here are some fun and cheap things to do this weekend in Boston! Boston Christmas Festival: November 2-4, 2018 at the Seaport World Trade Center. Find adorable holiday gifts from over 350 vendors, get holiday decorating ideas and get into the holiday spirit at this annual festival! Tickets are $15 and children 14 and under are free. Save $2 with this printable coupon. ILLUMINUS 2018: November 2-3, 2018 from 6-11PM at Downtown Crossing. Enjoy this free nighttime festival where Boston artists, designers, and performers will converge their talents! Zoo & Brew: Saturday, November 3, 2018 from 11-3PM at Sea Green (21 Stillings Street) in Boston. Enjoy a traveling petting zoo, brews from Trillium Brewery, puppet show, live music, and more. Admission is free but RSVP is required. (Note: This event is located close to the Boston Fire Museum and they are open 9:30-4pm on Saturdays by suggested donation, if you are looking for some more cheap family fun nearby). Kid Price Saturday at Zoo New England: Pay and feel like a kid the first Saturday of select months at Franklin Park Zoo and Stone Zoo where everyone pays kids price for admission until noon! Don’t forget about Daylight Savings Time this weekend so an extra hour of sleep on Sunday morning! Cheap Weekend Fun in Boston for October 27-28, 2018! There’s so many fun and cheap things to do this weekend in Boston and beyond! As always, please let me know if I missed any free events this weekend in the comments below! Pumpkin Palooza: Saturday, October 27, 2018 at The Lawn on D. Enjoy fun Halloween activities such as pumpkin carving, costume contest, train rides, and more! Castle Island Halloween Celebration: October 27-28, 2018. Enjoy a fun day at Castle Island with a variety of fun Halloween activities! Pru Boo: October 28, 2018 from 11-1pm at the Prudential Center. Wear your cutest costume and trick or treat for charity. Face painting, kid concert, pumpkin decorating and more. $5 donation towards nonprofit partner. North End Halloween Party & Parade: Saturday, October 27, 2018 at 1PM in the North End. Enjoy a parade through the North End + some Halloween fun! Annual Dia de Los Muertos Celebration: Saturday, October 27, 2018 from 12-5pm at Taza Chocolate Factory Store in Somerville. Enjoy food, music, face painting, and more at Taza Chocolate! Pet Parade: Saturday October 27, 2018 at Faneuil Hall Marketplace West End. Head to Faneuil Hall at noon for this annual pet parade and costume contest! Howl-O-Ween Pet Party: Saturday, October 27, 2018 from 11-1pm at the Seaport Hotel. Mix and mingle with other pet owners and pets and enter the pet costume party! Free and open to the public. SoWa Spooktacular: Sunday, October 28, 2018 from 10-4PM in the South End. Head to the last SoWa Open Market for the season with a big Halloween party! Tricks and Treat at the Waterworks: Saturday, October 27, 2018 from 11-3PM at the Waterworks Museum in Boston. Enjoy experiments, crafts, games, and more for this free event for all ages!